We got our hands on a pair of Apple's brand-new AirPods and we're giving them away! That's right, one lucky reader can win a pair of these wireless headphones and avoid Apple's 6-week wait. For the next seven days, AppleInsider readers can enter to win a pair of Apple's brand-new AirPods valued at $159. Originally announced on Sept. 7, these wireless headphones are in hot demand with a current wait time of six weeks when ordered directly from Apple. In fact, you can be one of the first people to try out Apple's latest accessory when you enter via the widget below. One lucky winner will receive a brand-new pair of Apple AirPods sealed in box with a charging case and Lightning to USB cable. These wireless earphones feature one-tap setup that makes pairing them with an iPhone, iPad, Apple Watch, or Mac quick and easy (you must have an iCloud account). The AirPods can even sense when you're listening and pause audio when you take them out. 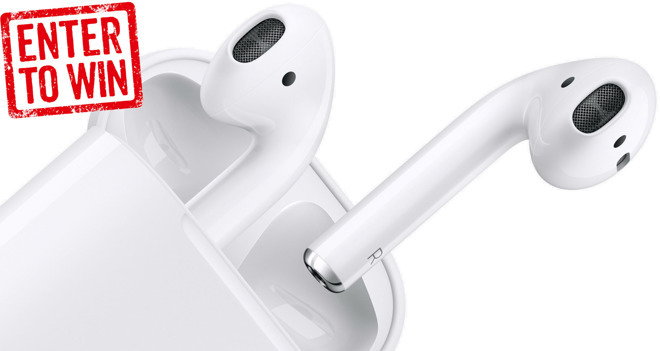 Users have the option of using one or both AirPods at a time thanks to optical sensors and motion accelerometers that work in tandem with the energy-efficient W1 chip. This allows for five hours of listening on a single charge. Entering the giveaway is super easy. Simply subscribe to our YouTube channel and leave a comment in our AirPods giveaway video for the most entries. You can also gain additional entries by following us on Instagram to view exclusive photos from Apple events. The entry period for this giveaway ends at 11:59 p.m. Eastern on Dec. 21, and the winner will be announced in a video on our YouTube channel on Dec. 22. Definitely check back to see if you've won. No purchase is necessary to enter and the contest is open to U.S. residents aged 18 years and older. Please note, contest entries will be verified upon selecting a winner.